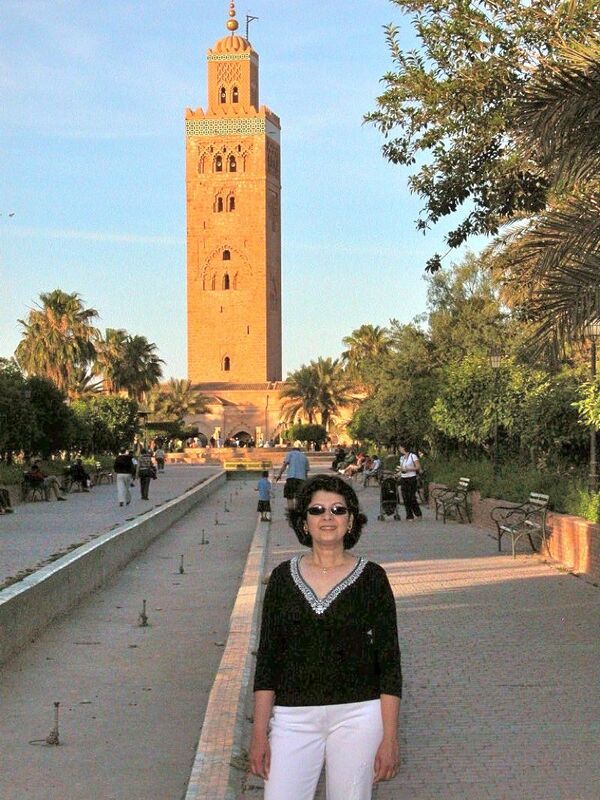 My first impression of Marrakesh, seen from the sky as our plane was landing, was of a city bathed in a soft red glow. 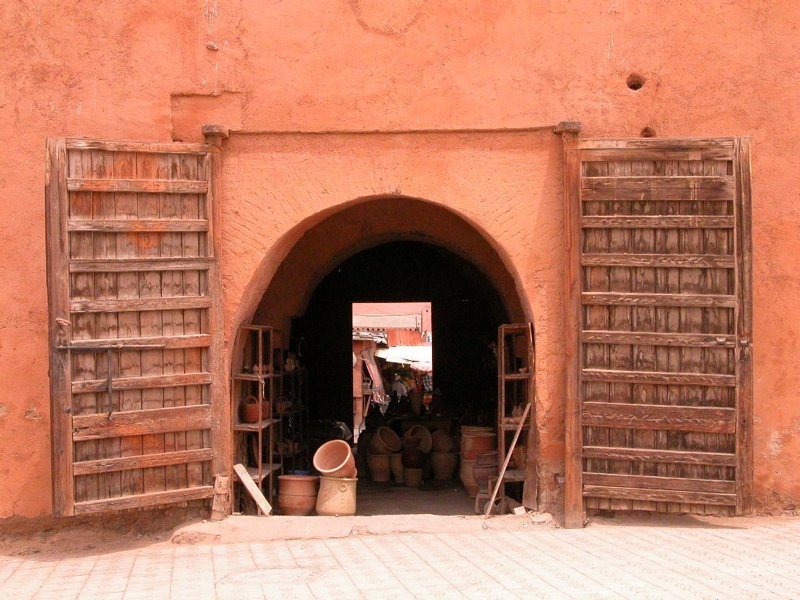 Later we learned that Marrakesh is actually called 'The city of red' because all its buildings are made of gorgeous red sandstone. 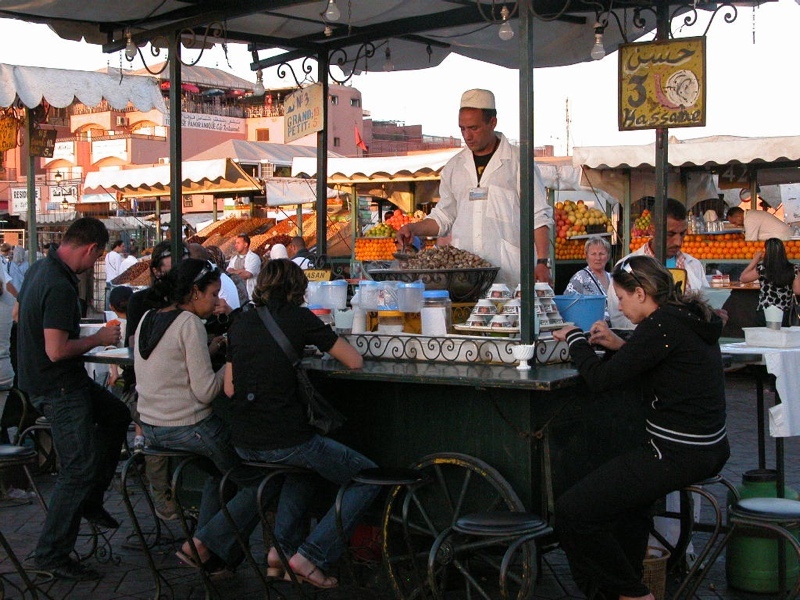 The heart of Marrakesh is a great square known as the Jemaa al Fnaa, which bustles all day with snake-charmers, musicians and dancers. 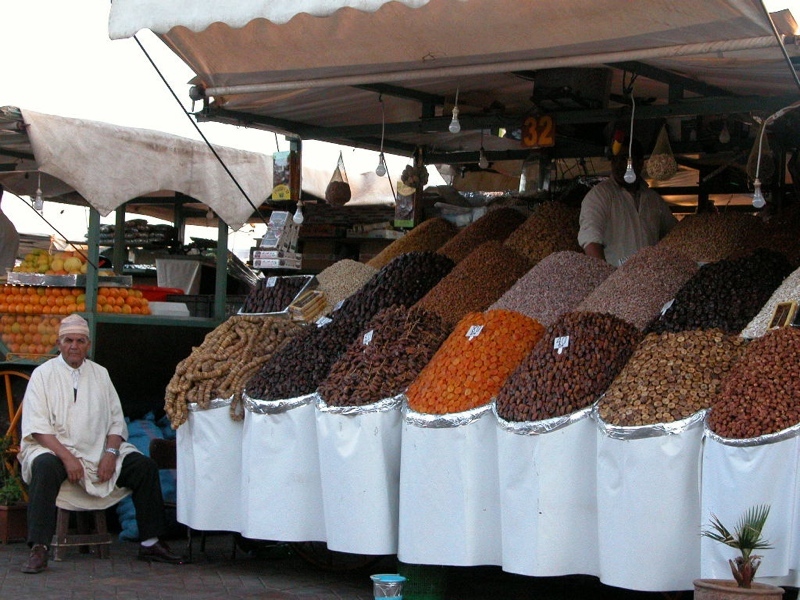 At night it is transformed into a giant food market with stalls offering nuts, dried fruits, juices and grilled meats. 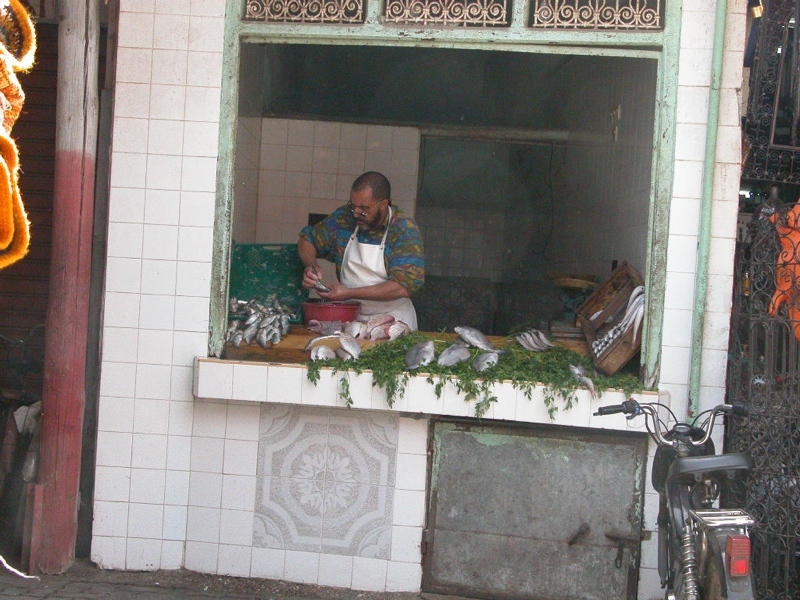 Clouds of aromatic smoke rise from open fires over which whole sheep are often roasted and served to customers sitting on benches that surround the grill. 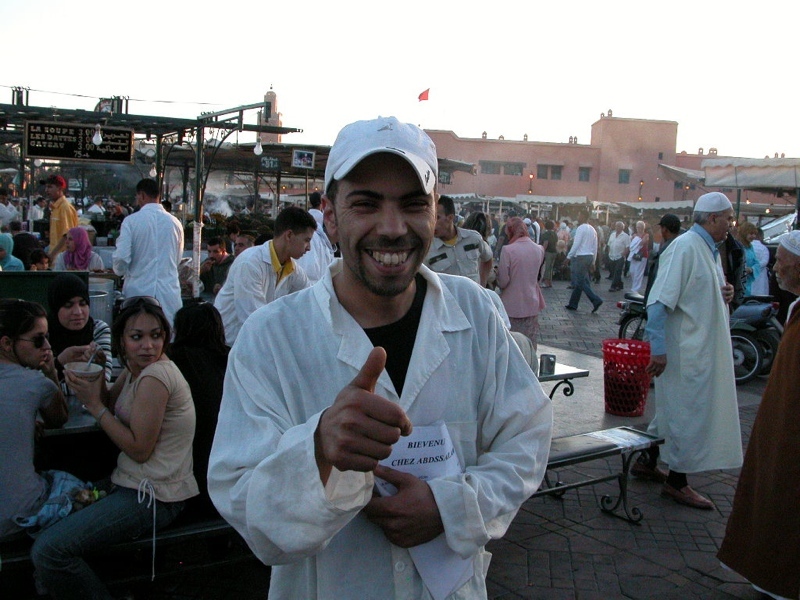 Vendors from each stall call out and try to entice you in, holding up menus that list all the delicacies available. 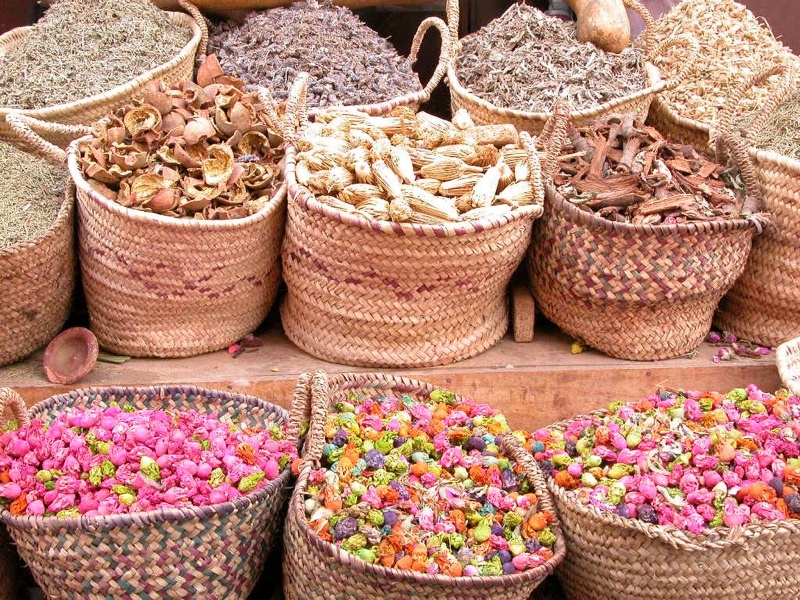 You can taste the best that Moroccan cuisine has to offer, right here at Jemaa al Fnaa. In one evening, we ate snails, fava beans, grilled lamb, mint tea, marinated olives, chicken tagine and countless interesting looking sweets! 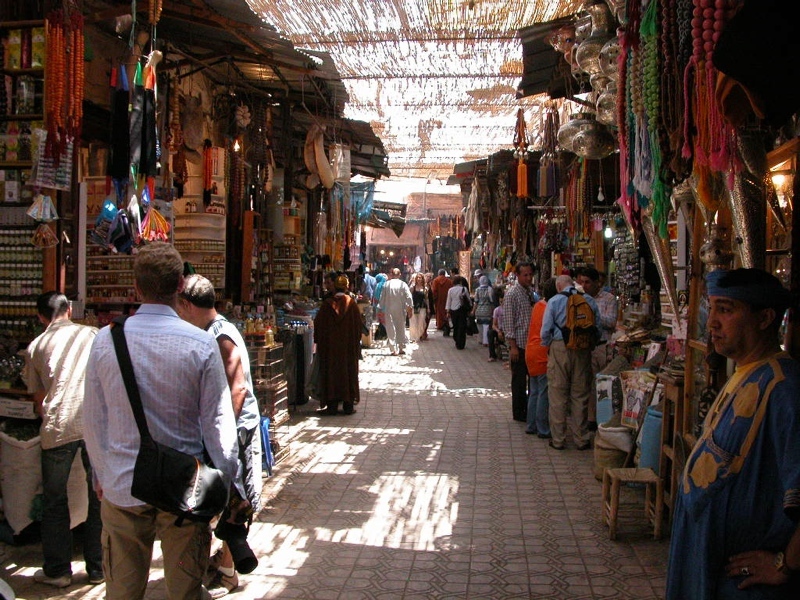 Surrounding the square is a warren of narrow alleys that make up the Medina, or market of Marrakesh. It is easy to get lost here, since no map can ever reliably guide you through this maze of lanes, courtyards, arched gateways and dead-end streets. 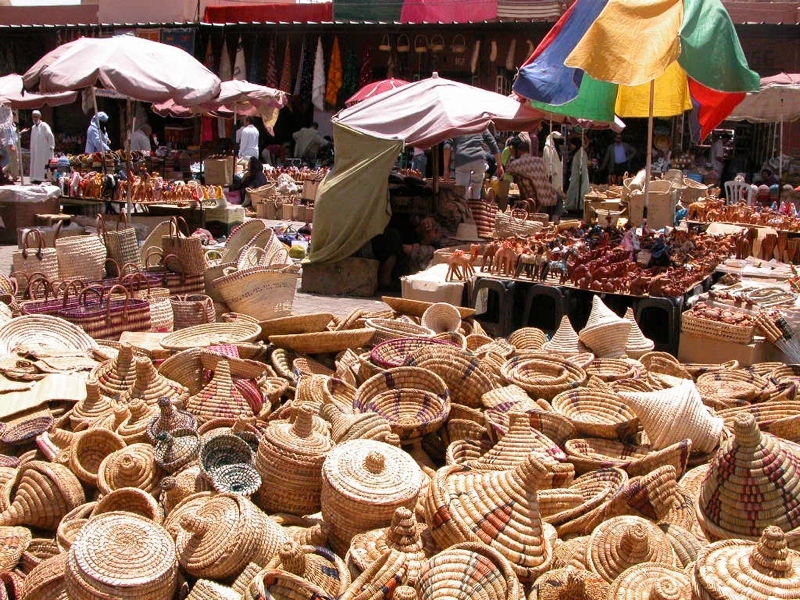 Every turning brings a new surprise and you can wander for hours, haggling over the price of carpets, leather and pottery while sampling sweets, nuts and Moroccan snacks. 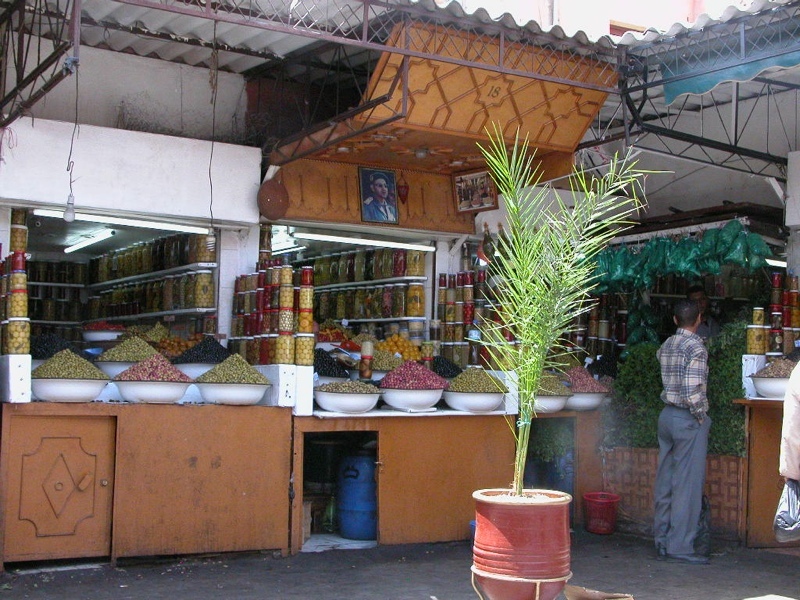 Getting pleasurably lost in the Medina was one of the highlights of our trip! 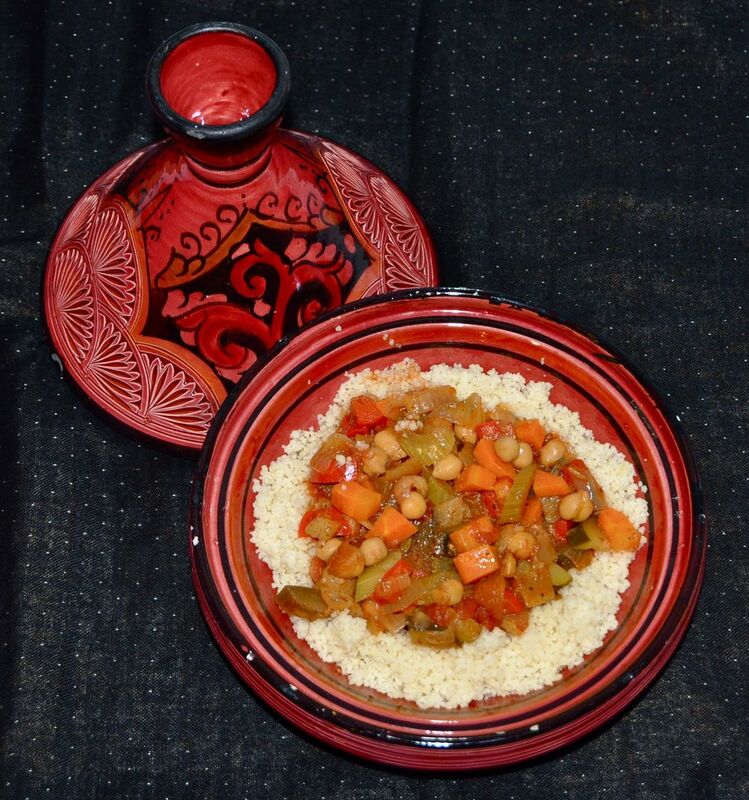 Cous cous with seven vegetable stew was one dish that i had to have almost every day while in Marrakesh! With little bits of preserved lemon in the stew and some flavorful chicken or lamb on top, it was easy to get addicted to. The presentation of this dish was often quite dramatic too - the cous cous in a mound in the center with the vegetables stacked all around it and the sauce in a bowl, to drizzle over top. The stew could easily pass off as Indian, being flavored with spices such as ground cumin and coriander and with herbs such as fresh coriander and mint. It was like a fantastic and unusual vegetable curry! My presentation is simpler and my stew is all vegetarian. If you'd like to, you can serve it with a skewer of grilled Moroccan chicken on top. You will find the recipe here. Warm oil in deep skillet set over medium high heat. Add onions and garlic, sauté 5 minutes until slightly softened. Add celery, carrot, zucchini, turnip and squash. Sauté 5 min. Reduce heat to medium, add tomatoes and broth or water. Add all spices, saffron, salt, chickpeas and preserved lemon (if using). Mix, cover and cook on medium low heat until vegetables are tender and broth slightly thick, about 20 - 25 minutes. Fold in the chopped herbs and remove from heat. Make cous cous according to package directions. Fluff up with a fork and mound it on a serving platter. Make a well in its centre. Place vegetables from the stew in the well. Drizzle some of the broth over top of cous cous and vegetables. Pour remaining broth into a bowl and pass it around the table for drizzling over cous cous.